Luckily, you can. I know of two directories that allow you to not only find a specific institutional repository, but also search the content of all repositories they have registered. 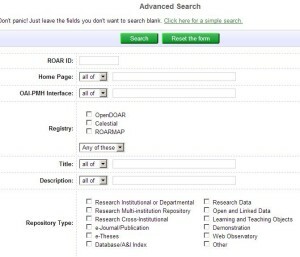 Namely ROAR, the Registry of Open Access Repositories and OpenDOAR, the Directory of Open Access Repositories. Both utilize a Google custom search engine that allows you to search across the repositories for specific terms. 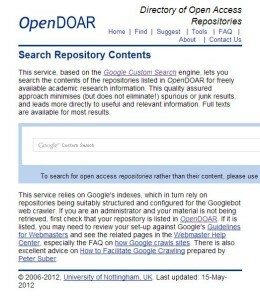 OpenDOAR’s search is a simple Google box. But don’t forget to use search operators for better searching! If you are a dedicated reader of this blog, you are sure to have come across stories about our own digital repository. 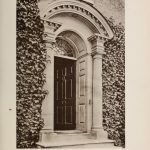 The Smithsonian Libraries is tasked with collecting digital content from the Smithsonian research community, both in order to preserve this vital record of research production and to make it accessible to anyone interested. And it may come as no surprise that academic and research institutions around the world are also collecting eprints of the research products of their communities and making them accessible as well. After all, the amount of public and foundational support for the research done at our towers of learning is staggering. Using public funding in much of this research even prompted a petition to the White House that resulted in a memorandum that directs federal agencies to develop plans on how to make the results of this funding publicly available. Luckily, the Smithsonian is ahead of the curve as we’ve already compiled over 29,000 18,000 publications in our repository. (Correction: that number was wishful thinking! RN).